Are You Ready For Higher Interest Rates? Alex Jones Conspiracy To Crash Bitcoin? What Is Next In The Casey Anthony Saga? Is The New Google Wallet Leading To The Mark Of The Beast? Are Donald Trump Seminars A Scam? James L. Paris, The Christian Consumer Advocate, Discusses Money and Politics. Practical Solutions To Everyday Financial Problems For Christians. 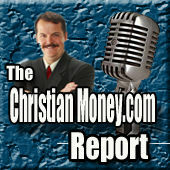 Hosted By James L. Paris and Robert G. Yetman, Jr, editors of Christian Money.com. Christian Financial Advice.